1 1. Preheat oven to 350°. 2. 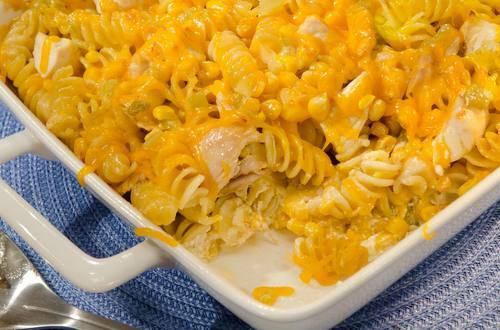 In 2-quart casserole, combine Hellmann's® or Best Foods® Real Mayonnaise, milk and 3/4 cup cheese. Stir in rotelle, chicken, corn and chilies. Sprinkle with remaining 1/4 cup cheese. 3. Bake 30 minutes or until heated through.